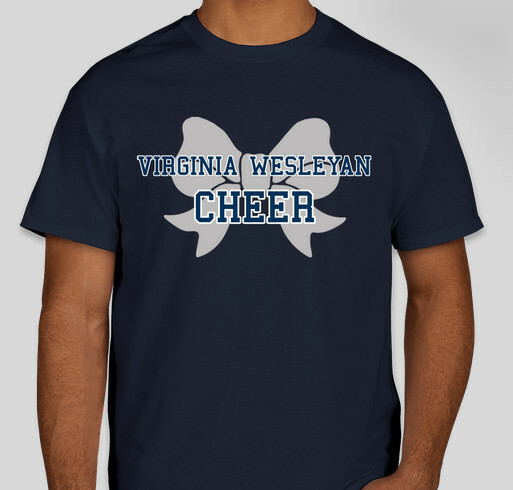 Buy a VWC Cheer T-shirt to show your Marlin Spirit! All funds raised will be paid directly to VWC Cheer for Help us get to Nationals!. We are the official cheerleading team of Virginia Wesleyan College, a Division III cheerleading squad that supports all VWC Athletic teams. We preform at all Men's and Women Basketball games during the season, as well as preform at homecoming and other campus wide events. We are currently in a rebuilding stage in our program. We are trying to raise enough money to purchase new uniforms and stunting mats. But our biggest ecpense we are working toward is Competition expenses, we are working toward heading to the National College Cheerleading & Dance Championship in Orlando Florida. We work hard everyday and are very committed to cheering on all of our Virginia Wesleyan College sports teams. We would love and appreciate all of your support! Very proud of Ashley and this team! Keep working hard! Share Why You Support "VWC Cheer T-shirt Sale"